Place pumpkin and the water in a medium microwave-safe dish. Microwave on HIGH (100%) for 5 minutes or until tender. Mash pumpkin; season to taste. Add corn, chilli, garlic and grated cheese to pumpkin; season. Heat a small non-stick frying pan over medium heat. Place tortilla into pan; warm gently for 1 minute or until pliable. Spread pumpkin mixture over one half of the warmed tortilla while still in pan. Fold over to enclose (tortilla may break at this stage if not warmed through). Cook quesadilla for 2 minutes each side or until golden and cooked through. Meanwhile, combine tomato, onion, coriander and juice in a small bowl; season to taste. 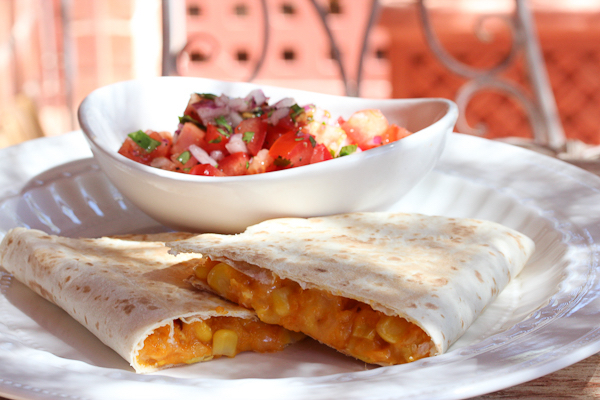 Serve quesadilla with the tomato salsa. Increase the amount of chilli flakes if you would like a little extra heat. If making ahead of time, assemble the quesadilla, then wrap tightly with plastic wrap and refrigerate until needed. The pumpkin can be boiled or steamed, if you prefer.